The English Department of YWPS first launched the Reading Strategies Training Scheme (RSTS) as a reading instruction concept in the year 2010-2011. The scheme was then developed into a comprehensive reading programme for the entire school for the next two years. RSTS booklets are being formulated and upgraded as the scheme progresses. The RSTS is primarily module-based. Each term, for each level, three to four reading strategies training modules are implemented. Each module lasts for three to four lessons, depending on the standard and progress of the class. And there are one to two texts chosen as teaching materials, through which the reading strategies are introduced. *Hudson, T. (2007). Teaching second language reading. Oxford: Oxford University Press. It is our belief that while skillful readers naturally possess their sets of reading strategies, the strategies themselves can be taught to less skillful readers to help them read more fluently. We do not do it for assessments, but a potential long-term benefit on developing students into active, engaged, and autonomous readers of English. We believe that, under proper training, students in the short run will be aware of the strategies involved in English reading comprehension which may help them read better; and, in the long run, students will be able to read fluently, comprehend better, and be able to solve problems from reading English texts. Here is a sample break down of RSTS modules for P.1-2 as a guideline for teachers to follow when designing the booklet for a given year. One developmental trend of the RSTS materials is the compiling of a school-based comprehension book, we named it Reading Strategies Training Booklets (RSTB). It highlights the general reading strategies as reminders. It consists of various genres of texts, explicitly categorized. It is user-friendly and highly presentable in layout. 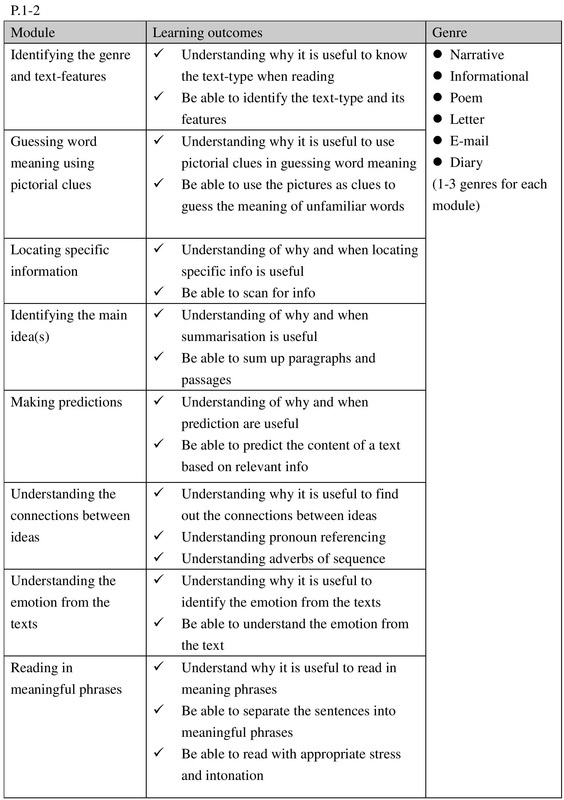 It has post-reading questions to consolidate students’ understanding of the texts. Students of all levels receive an RSTB per term with 3-4 modules of work. Each booklet is a school-based design by the English teachers and the materials are revised yearly. For senior students (P.5-6), together with the Reading Logs (School-based book report booklets), their performance in the RSTB is an essential factor determining their eligibility to receive an award in the Reading Championship. For a more detailed report on RSTS, please refer to the paper "A Case Study: Reading Strategies Training Scheme in a Hong Kong Primary School" (2017) written by Dr Lee, the English Panel Chair.